A tired appearance of your eyes that attracts unwanted comments and questions from others, undermining your self-confidence? Dark circles or hollows under the eyes? Eye “bags” causing an aged appearance? Hooding of the upper eyelids (a problem which prevents the application of make up in women)? If so, you may benefit from a blepharoplasty. A blepharoplasty is a cosmetic eyelid surgery operation that removes loose folds of skin from the upper eyelids and improves eye “bags” in the lower eyelids. A cosmetic blepharoplasty is often referred to as an eye lift, an eyelid lift, cosmetic eye surgery, cosmetic eyelid surgery, or an eye bag removal operation. 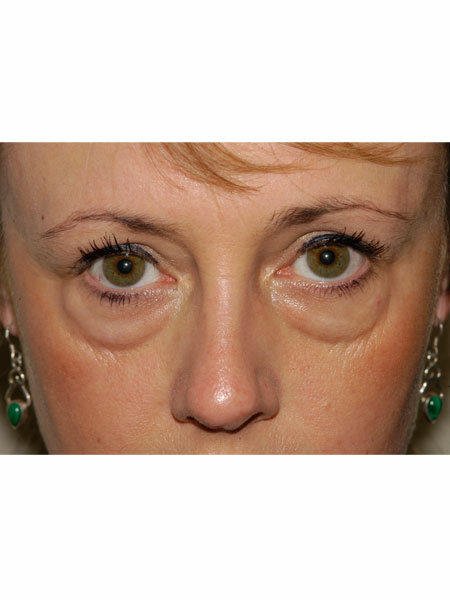 A patient with hooding of the upper eyelids and loose folds of skin in the lower eyelids causing a tired appearance. The same patient 3 months following cosmetic eyelid surgery. 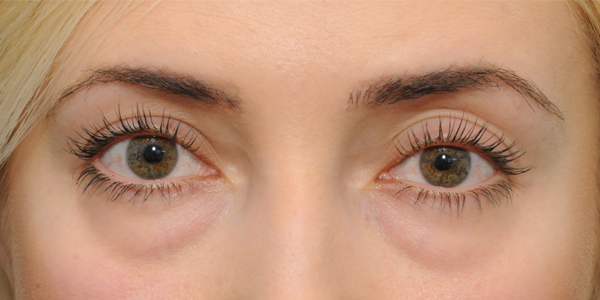 A photograph of the same patient following a ‘scarless’ lower lid blepharoplasty (transconjunctival blepharoplasty with fat repositioning). An upper eyelid blepharoplasty is performed for people who have droopy, overhanging eyelid skin that impairs vision, causes frequent blinking and eye fatigue, looks unsightly causing a cosmetic problem, or prevents the application of make up. It can be combined with ptosis surgery if there is an associated droop of the upper eyelid itself. An eyebrow ptosis (drooping of the eyebrows) contributes to the problem and may need to be addressed at the same time. A lower eyelid blepharoplasty is also performed on people who have “puffy” lower eyelids or eye “bags” that may look unsightly, or loose folds of skin. An edited video of a patient undergoing a lower lid transconjunctival blepharoplasty with fat repositioning at the Face & Eye Clinic under “twilight anaesthesia” can be seen by clicking here. The video shows the surgery being undertaken without any bleeding with the use of a Colorado needle instead of a blade and scissors. A consultation with an expert oculoplastic surgeon can provide a comprehensive assessment of your cosmetic eyelid problem, and a discussion of the available treatment options. Before any surgery is undertaken it is very important that other potential medical problems are excluded as an underlying cause of the complaint e.g. an underactive thyroid gland can cause puffy eyelids. Review the patient safety guidelines from the British Association of Aesthetic Plastic Surgeons at baaps.org.uk. An ophthalmologist who is also an oculoplastic or oculofacial surgeon has the required skills and equipment to examine your eyes properly (before and after surgery), and the appropriate training, skills and experience to undertake this highly specialist surgery. Some patients with lower lid dark circles or tear trough defects also have a soft tissue hollowing in the upper cheek area, and in the outer area of the eyelids. This soft tissue hollowing can often be improved either with the additional use of dermal filler injections, or for a more lasting effect, with the use of microfat injections (similar to Coleman fat injections, or structural fat grafting, but with the use of finer, specialised injection cannulas). Nanofat injections can also be used to improve the appearance of fine skin lines. 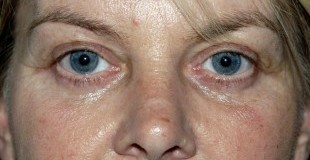 The patient seen 3 months after a bilateral upper lid blepharoplasty and a bilateral lower lid transconjunctival blepharoplasty with fat repositioning (a scarless lower lid blepharoplasty). 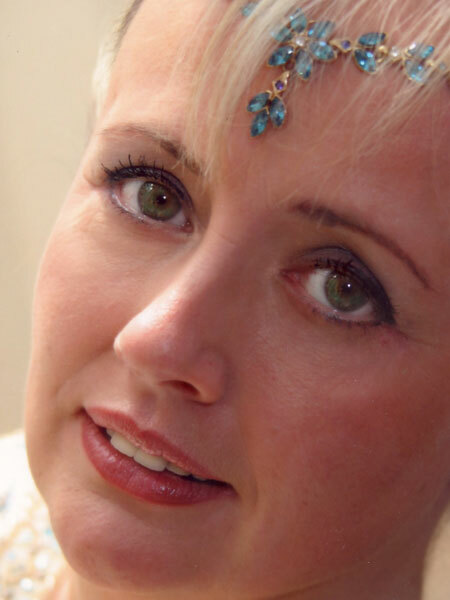 The patient also has a ‘chemical brow lift’ from the use of Azzalure injections. Your eyes are precious. Only entrust them to an appropriately trained and experienced surgeon. Do your research. Patient ConfidentialityPlease note that, while many of my patients have very kindly consented to the use of their photographs for this website, others prefer that their photographs are only shown in my portfolio in my clinic Face & Eye. These can be viewed at my clinic. Many other patients do not wish their photographs to be used for any purpose other than their own records and their confidentiality is respected. When upper eyelid cosmetic surgery is undertaken, a curved incision is made through the upper eyelid crease above the eyelashes and a crescent-shaped piece of skin is removed. The area of skin to be removed is first marked out (as shown in the photograph below), ensuring that the patient can easily close the eye when the skin is gently pinched with forceps. The redundant upper lid skin to be removed has been marked out with gentian violet leaving at least 10-12 mm of skin between the eyebrow and the upper skin marking to ensure that the surgery does not compromise blinking and protection of the eye.In patients with bulges of fat, particularly in the inner corner of the upper eyelid, some of the fat is also carefully debulked or repositioned. Tiny blue dissolvable sutures (stitches) are inserted to close the skin wound. These are removed in clinic after approximately 10-14 days. An eyebrow lifting or stabilizing procedure may need to be performed at the same time to achieve the desired result and to prevent the brow from dropping down further following the removal of upper eyelid skin. In some patients the appearance of “hooded” upper eyelids with overhanging skin is caused by a droop of the eyebrows rather than just by an excess of upper eyelid skin. A blepharoplasty alone may then be inappropriate and may in fact worsen the appearance. An operation to lift the eyebrows may be required instead or in addition. If appropriate in your own individual case this will be discussed with you. There are a number of different procedures that can be undertaken to raise eyebrows. The one most suited to the individual needs of the patient is selected. Alternatively, for some patients, botulinum toxin injections can be used to achieve a “chemical brow lift” 2-3 weeks before the upper lid blepharoplasty. These injections are then repeated at 3-4 monthly intervals. 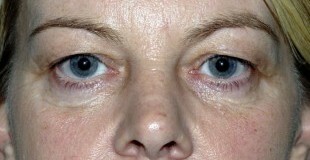 Lower lid “bags” are usually caused by bulging eyelid fat (see the diagram). The traditional approach to the cosmetic surgical improvement of lower eyelid “bags” or “eye bags” has been to remove the bulging eyelid fat. While this method can indeed remove eye bags, particularly when these are severe, in many patients it can result in a hollowed and more aged appearance once the postoperative swelling has subsided. This is in contrast to the appearance of the youthful face, in which soft tissue fullness creates a smooth transition from the lower eyelid to the cheek. The bony orbital bony margin is concealed. One such technique that has gained prominence to improve the appearance of the lower eyelid is fat repositioning, in which eyelid fat is advanced over the inferior orbital margin (the cheek bone at the junction of the eyelid and cheek) rather than removed. This technique is designed to conceal the underlying bony structure of the lower orbital margin (bony socket) in an attempt to impart a more pleasing contour to the eyelid area, improving a tired look. This procedure is more time consuming and requires more skill and experience, but has a very high patient satisfaction rate. 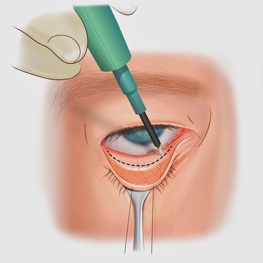 For many patients, particularly those under the age of 55 who don’t have loose skin in the lower eyelids, a lower lid blepharoplasty is often performed via the inside of the eyelid (a transconjunctival blepharoplasty) which leaves no visible external skin scar (see illustrations below). This is usually performed on patients approximately 30-55 years of age who do not need any skin to be removed (or who can be managed with a very small “skin pinch” excision at the same time or later, when all the postoperative swelling has settled). Any skin laxity or wrinkling after surgery can be addressed by other methods at a later stage e.g. with a mild chemical peel or by means of laser resurfacing by a specialist dermatology colleague. In our experience, however, the vast majority of patients do not require this. Some patients with hollowing of the cheeks and lower lid bags also benefit from fat injections to the cheeks (see the information under facial fat injections) or, if preferred, hyaluronic acid dermal filler injections. 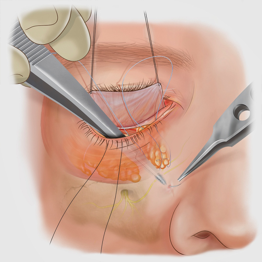 An incision is made on the inside of the lower eyelid using a Colorado needle. This minimises bleeding. A flap of conjunctiva is pulled up over the eye to protect it and stitches are passed through the fat. 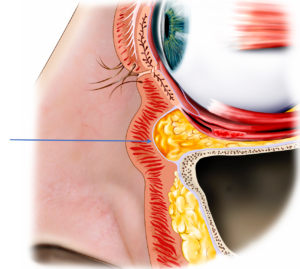 The fat is then pulled into a space created over the bone of the eye socket with Prolene sutures. These are passed through the skin of the cheek. 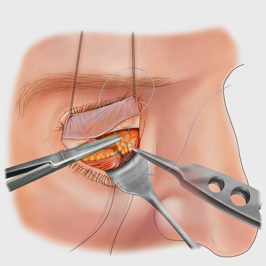 The needles are passed away from the eye and are brought out through the skin below the eyelids and tied over small sterile yellow sponge bolsters to protect the skin when the Prolene stitches are tied (see the photograph below). The stitches are left in place for 2 days and are then removed in clinic. The conjunctival wound on the inside of the lower eyelid is closed with Artiss, a fibrin sealant, which also helps to minimize the risk of postoperative bleeding. The bolsters leave small indentations in the skin temporarily. These respond to massage postoperatively using an antibiotic ointment and typically disappear after 2-3 days. The transposed fat becomes lumpy (to touch rather than to see) after approximately 2 weeks and is then massaged after applying Auriderm cream to the skin. The fat then gradually softens over the course of the next 2-3 weeks. This surgical approach is associated with a much lower risk of postoperative lower eyelid retraction, particularly in patients with prominent eyes (often referred to as ‘a negative vector’ patient) and avoids the risk of rounding of the outer aspect of the eyelids. The recovery period is also much shorter than a skin incision approach. Once a full recovery has been made (typically after 3-4 months), this approach usually leaves no visible signs of the surgery. Most patients can apply make-up after 2-3 weeks and, apart from some slight puffiness of the lower lids, the appearance is good. In a transcutaneous (‘through the skin’) blepharoplasty a horizontal incision is made in the skin just below the eyelashes of the lower eyelid and continued along a laughter line at the outer corner of the eyelid. This approach is used for patients who require the removal of loose folds of skin or who also need the addition of a mid-face lift. In patients with very marked fat bulges, the fat can be debulked. In others the fat will be repositioned. If the fat is to be repositioned over the lower bony margin of the orbit, Prolene stitches and sponge bolsters are used for this purpose (as described above). Lower lid blepharoplasty surgery, both transconjunctival and transcutaneous, is performed using a “Colorado needle” rather than a surgical blade and scissors. This greatly reduces bleeding and in turn allows a faster recovery time with less postoperative bruising and swelling. A laser is not used to make incisions as this offers no advantages (in spite of claims to the contrary by some surgeons) and involves far more risk to the eyes. The outcome of the surgery can be further enhanced by the use of microfat injections to the outer eyelid area and to the central cheek. Alternatively, dermal filler injections can be used post operatively. Upper and lower eyelid blepharoplasty surgery can be performed under local anaesthesia, local anaesthesia with sedation by a specialist consultant anaesthetist (twilight anaesthesia), or under general anaesthesia. Most patients, who are fit and well, choose to undergo the surgery under twilight anaesthesia on a day case basis in the operating theatre at our clinic Face & Eye. For those patients who live at a distance from the clinic, an overnight stay close by in a local hotel is advised for safety. For those patients who wish to undergo surgery under general anaesthesia, the surgery is undertaken at a local private hospital e.g. the Spire Manchester Hospital, or in the private wing of Manchester Royal Eye Hospital. It is very helpful if you could bring along some old photographs to the consultation. If you are happy to email us digital photographs of your current appearance in advance of the consultation with details of your concerns, this is also enormously helpful and saves time. Your photographs will be kept confidential and will form part of your clinical record. You may have your blood pressure checked by my nurses. Please answer all questions completely and honestly as they are asked only for your own well being, so that your cosmetic surgery can be planned as carefully as possible. The information is treated confidentially. If you are unsure of the names of any medications, bring them with you. Your vision in each eye is measured. Your eyes are examined carefully using a slit lamp (a special ophthalmic microscope). The rest of your face is then examined. The general condition of your skin is assessed and photographs of your face and eyelids are taken before surgery so that the results of surgery can be compared with the original appearance. The photographs are confidential and can only be used for any purpose other than your own records with your specific written permission. All my patients are provided with a detailed report following a consultation. This summarises the consultation, the recommendations and also the preoperative and postoperative requirements. I much prefer that my patients return to see me in clinic before proceeding with their surgery so that I can have the opportunity to answer any queries and so that a consent form for surgery is completed in advance and not on the day of surgery. If a patient is travelling a long distance however, this second consultation can be omitted and instead queries can be addressed by email and a copy of the consent form sent in advance so that this can be checked by you. What are the possible complications of cosmetic eyelid surgery? Blurred or double vision, lasting mainly for a few hours, and sometimes up to a day or two after surgery or longer. This may occur for several reasons – ointment put in the eyes immediately after the operation, local anaesthetic used in the operation, swelling of the muscles that control eye movement or swelling of the normally clear covering around the eye (the conjunctiva). Swelling of the conjunctiva (this may mimic a severe hay fever reaction) is referred to as “chemosis” and in some patients can take a few weeks to resolve. If blurring persists for longer than 48 hours, it is important to inform your surgeon. Dry eyes may persist for two to three weeks or sometimes longer. You will need to lubricate your eyes every 1-2 hours using artificial tears during the day (e.g. Hyabak drops, Hylo Forte drops or Xailin gel) and an ointment at night (Xailin ointment). These will be prescribed for you. You will gradually reduce the frequency until you can dispense with them altogether. It is very rare for patients to have to continue with them long-term but this is possible. This is why it is important to exclude a dry eye problem before proceeding with this type of surgery. Bleeding. A collection of blood around the eyelids or behind the eyeball, is called a haematoma. A sudden haematoma behind the eyeball can cause loss of eyesight if not managed appropriately and without delay. This is the most serious potential complication of this surgery but is extremely rare. An oculoplastic surgeon is trained both to prevent and to manage such a problem. A haematoma usually needs to be drained in the operating theatre. Damage to the muscles that move the eyeball (e.g. the inferior oblique muscle from the use of cautery to seal a bleeding blood vessel adjacent to the muscle) causing double vision is a very rare problem and this usually resolves by itself with time. In the very unlikely event that double vision were to persist, a referral to another ophthalmic surgeon with expertise in the management of eye movement disorders and possible further surgical intervention would be required. 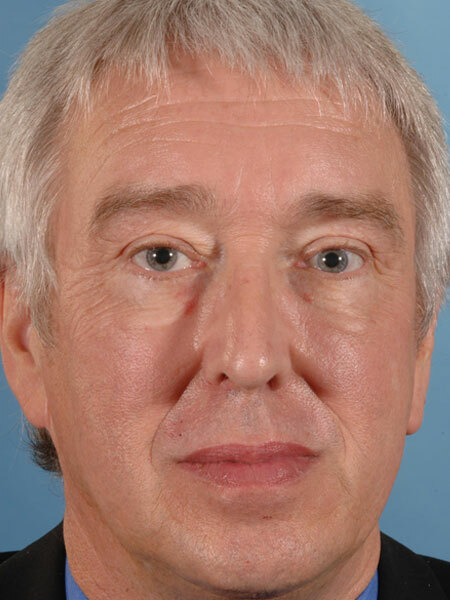 A ptosis (a droopy upper eyelid). Another operation may be necessary to repair this. An oculoplastic surgeon undertakes ptosis surgery routinely. A sunken-looking eye can occur if too much fatty tissue is removed. Modern approaches to a lower eyelid blepharoplasty aim to preserve and reposition fat in the lower eyelids over the lower eyelid rims to avoid this problem. Should this occur, further surgery can be undertaken to replace fat. This is usually taken as tiny fat pearls from just below the umbilicus (the tummy button). For the same reason, the debulking of fat in the upper lid is also undertaken very conservatively. Mr Leatherbarrow often undertakes this secondary reconstructive surgery for hollowing due to eyelid surgery undertaken by plastic surgeons elsewhere. Infection. An infection following this surgery is very rare but it is important to follow postoperative wound care instructions to help to prevent such a problem. These should be given to you in writing for you to take home following surgery. A prescription for antibiotics is given to you following the surgery so that there is no delay in commencing this treatment should you develop any signs or symptoms suggestive of the development of an infection. Lower eyelid retraction leaving the white of the eye visible just above the edge or margin of the lower eyelid. The incidence of this following a lower lid blepharoplasty varies from surgeon to surgeon and the risk is greater in patients with more prominent eyes and where such surgery has been performed previously. This problem is more commonly seen with a transcutaneous lower eyelid blepharoplasty. Precautions are taken to minimise the risk of this developing. It may require further surgery to address it if it occurs e.g. with the use of a small dermal or dermis fat graft. A higher lower lid position. Rarely, the lower eyelids may remain slightly high following a lower lid transconjunctival blepharoplasty if the eyelid retractors are not reattached or if excessive swelling causes a separation of the wound. The eyelid may not move downwards properly when looking down, requiring a chin down posture to compensate for this. It is for this reason that Tisseel is used to close the wound on the inside of the eyelid. Rounding of the outer aspect of the eyelids with shortening of the horizontal dimension of the eyelids can occur following a transcutaneous lower lid blepharoplasty. The incidence varies from surgeon to surgeon. This can lead to an unsatisfactory cosmetic result and it can be a very difficult problem to address with further surgery. This is not a problem that has been encountered in my own practice. Scarring. Most eyelid wounds heal with scars that are barely perceptible although full maturation of the wounds can take some months. Poor scarring can follow infection or wound disruption but this is very rare. Poor scars can be treated with steroid injections or Botox injections, or with the application of silicone gels e.g. Dermatix or Kelocote. Rarely, scars need to be revised surgically. Eyelid lumps. Lumps can very occasionally occur as a reaction to sutures used to close the wounds. These usually resolve with time but occasionally steroid injections are required. Lumpiness can occur in fat that is repositioned over the inferior orbital margin. This usually responds to postoperative massage. Granuloma. A pink fleshy lump can occur as a stitch reaction on the inside of the lower eyelid following a transconjunctival blepharoplasty. This often resolves with the use of a course of postoperative steroid eye drops but occasionally the granuloma needs to be removed surgically in the clinic or operating theatre. The use of Artiss, a fibrin sealant, rather than sutures, minimizes the risk of this occurring. After surgery, the eyes are initially covered with pressure dressings for approximately half an hour to reduce postoperative swelling and the wounds are treated with antibiotic ointment. The dressings are then removed and replaced with cool packs. Activity is restricted for 2 weeks to prevent bleeding. You will be asked to clean the eyelids very gently using clean cotton wool and Normasol (sterile saline) or cooled boiled water, or saline wipes, and to repeat the application of antibiotic ointment (usually Chloramphenicol or Soframycin) to the wounds 3 times a day for 2 weeks. The sutures used are usually dissolvable and are usually removed in clinic after 2 weeks. The skin around the eyes should be protected from direct sunlight, by avoidance if possible or by using protective sunglasses. Wearing make-up should be avoided for at least 2 weeks. After 2 weeks the use of mineral make-up is recommended. (The aesthetics nurses at the clinic Face & Eye can demonstrate this to you). It is important to devote a lot of time to your aftercare for the first 2 weeks and some patients find this somewhat labour intensive. A realistic period of recovery must be expected. Postoperative bruising usually takes at least 2-3 weeks to subside completely. Swelling takes much longer. Most of the swelling disappears after 3-4 weeks but this can vary considerably from patient to patient as does the extent of the swelling. The final result is not seen for at least 3-4 months. This should be taken into consideration when scheduling the operation. You should arrange this surgery after holiday periods or important professional or social events and not before so that you are available for postoperative review and just in case any surgical adjustments are required. The scars gradually fade to fine white marks within a few months. Those in the upper eyelid are hidden within the skin crease unless an additional skin incision is required to remove a “dog-ear” of excess skin just below the tail of the eyebrow. Those in the lower lids are usually barely visible beneath the eyelashes. The marks in the laughter lines at the outer corner of the eyelids can be camouflaged with make up. You will need to use frequent artificial tears for the first 2-3 weeks following surgery. It is preferable to use preservative free drops. These will be prescribed for you e.g. Hyabak drops, Hylo Forte eye drops or Xailin gel, and Xailin ointment at bedtime. Alternative bedtime medications are: Lacrilube ointment, VitaPos ointment or Artelac night time gel. It is often recommended that you use Xailin gel to the eyes 1-2 hourly for the first 48 hours after surgery following any upper lid surgery but note that this will cause blurring of vision. (You should not drive for the first few days after surgery). These medications can be purchased from my clinic Face & Eye. You should not pull the lower eyelid down to put these drops or ointments in the eyes following lower eyelid surgery. Chemosis, a swelling of the conjunctiva, the membrane covering the white of the eyes, often occurs following this surgery, particularly with the transconjunctival approach. This usually takes 1-2 weeks to resolve but can take longer in some patients. Artificial tears must be used every 1-2 hours during the day until this has gone. A period of postoperative massage is often advised following lower eyelid surgery. You will be shown how to do this. It is usually undertaken after applying some Auriderm cream to the eyelid skin following a transconjunctival blepharoplasty and using Xailin ointment following a transcutaneous lower lid blepharoplasty. The massage helps to reduce swelling, lumpiness of transposed fat, and to prevent eyelid retraction. It is usually undertaken for 3 minutes 3 times a day. There are many additional non-surgical treatments which can help to maintain the improvements achieved by your surgery. Mr Leatherbarrow’s aesthetic nurses at his clinic Face & Eye are happy to see you to discuss these e.g. microdermabrasion, skin booster injections, skin peels, protective skin creams, dermal filler injections, anti-wrinkle injections, Pelleve, and mineral make-up. In addition, Becky (Mrs Rebecca Rietdyke), Mr Leatherbarrow’s specialist optometry colleague, can provide contact lenses or glasses to suit your needs. Preoperative appearance of a patient with “hooded” upper eyelids due to excess upper eyelid skin and a mild brow ptosis, and lower eyelid skin laxity. 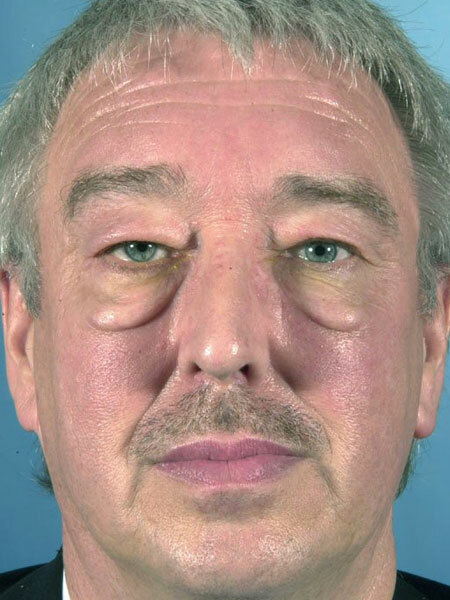 Postoperative cosmetic appearance of the same patient 3 months following a bilateral upper eyelid blepharoplasty, internal brow lift and a bilateral lower eyelid blepharoplasty with orbicularis muscle suspension. Conscious sedation, also known as “twilight anaesthesia”, is a type of anaesthesia which is preferred by many patients for most of our surgical procedures. It is a very comfortable and gentle type of anaesthesia which is safer and far less invasive than general anaesthesia but at the same time highly effective. It is also of advantage for very nervous or anxious patients undergoing quite minor surgical procedures. Typically patients sleep most of the way through their procedure and have no or very little recollection of it at all. You are looked after throughout the procedure by a specialist consultant anaesthetist who has many years of experience of this type of anaesthesia, so that your surgeon can concentrate fully on your operation. Shortly before moving to the operating room, a small tube (cannula) is placed into a vein in the back of your hand by the consultant anaesthetist and the anaesthetic drug is given through that. This is Propofol, a drug which is also used for general anaesthesia but, for conscious sedation, much lower doses are used. With conscious sedation there is no breathing tube or breathing machine, just a gentle flow of oxygen given through a plastic tube within a soft sponge protector inserted into one of your nostrils. Once the sedation has been commenced a local anaesthetic solution (a mixture of Marcaine and Lignocaine) is injected into the operative area to ensure a painless procedure. Typical side effects of general anaesthesia including a sore throat and nausea are avoided. Waking up takes only a few minutes at the completion of the surgery and is usually free of any “grogginess.” This type of anaesthesia has been used safely and successfully for our surgical procedures for over 20 years. Click here to watch a video of a patient describing her experience of “twilight anaesthesia”. She underwent a bilateral upper lid blepharoplasty and endobrow lift at the clinic. To learn more about Cosmetic Eyelid Surgery (Blepharoplasty), please contact us at today to schedule an appointment.